What is the best way to heat a greenhouse? Most growers are looking for ways to extend the market season and to bring crops in early when demand is high. Cold tolerant crop selection, row cover, quick hoops and cold frames are relatively low cost options but a little supplemental heat is often useful, even if it is just in your transplant greenhouse. While the question is heating several preliminary steps may reduce the size of the heater you need or allow you to do without a heater, depending on your crop. Optimizing solar gain is probably the first step in greenhouse heating. Even on overcast days most greenhouse heating comes from the sun. Placing your greenhouse on a east-west axis optimizes solar gain. If you are considering a passive solar greenhouse, this is the best choice if your site allows. Most commercial greenhouses are oriented north-south to avoid shading problems as the sun moves across from east to west. Potential shading problems in an east-west house can be minimized by putting shorter crops near the south wall and taller ones to the north. Our greenhouses run roughly north-south. As with a home energy audit, the next step is to minimize air leaks in your greenhouse. We used four cans of spray foam insulation last spring improving the connection between our sidewalls and roll-up sides. Your crop may need ventilation – particularly on cloudy days when the cooling fans are not operating. Actively growing crops can use most of the carbon dioxide in the greenhouse if it has no vents. Lack of CO2 reduces plant growth and yield. 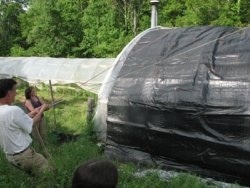 Once you tighten up your greenhouse periodic ventilation becomes more of a concern. I suggest a vent fan on a timer to exchange the volume of your greenhouse about once an hour. To save fuel you may not want to vent as much at night but be aware of humidity increases if you reduce ventilation frequency. High humidity can bring on disease problems. Following the energy audit analogy – plug leaks first then insulate your greenhouse. Your first step should be to deal with the north wall. If it’s a poly house like ours consider an inch or two of insulation put between the frame and the poly on the north wall. Foam with a foil surface will actually improve solar gain by bouncing light off the north wall onto your crop. We also added an insulated knee walls on the east and west sides. I plan to do the south wall too. The knee wall (2-4 feet high) casts a small shadow but only very early or late in the day when sun intensity is low. One vendor of the insulation that we used is at http://www.insulation4less.com/Default.aspx we made the purchase several years ago so better options may exist now but the site describes their product fairly well (double foil over closed cell foam). I can give more detail on making the insulation quilts if folks are interested, but in short it’s a sheet of closed cell foam quilted to two layers of landscape fabric with baling twine. We found this approach cheaper and more durable than cement curing blankets which we also considered. On to heating options – propane or natural gas heaters seem most common in the US but we have found that style of greenhouse heater generally unreliable. Pilot lights blow out. Heat exchangers rust out. Bugs love to build nests in gas burners in the summer often plugging up parts of the burner and on and on. Vendors seem to see heaters as disposable devices so I recommend having a redundant system – two smaller heaters instead of one larger one. One of my most depressing days began with finding that the heater failed overnight and that my tomato crop was frozen. 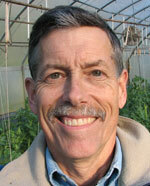 Hal Oliver, a grower in Hendersonville seems to be a local expert on propane heat. Look for his ASAP post last year on heater maintenance. Others use oil or even waste oil. The Dutch are the world leaders in greenhouse vegetable technology in my view. Many of their growers use boilers during the days and circulate the hot water through heating pipes at night in the aisles between the beds. Those pipes also support harvest carts. Normally a large insulated hot water tank is the source of the hot water. With a boiler approach, any number of fuels can be used including wood. Mountain Harvest in Spring Creek showed CRAFT their hydronic (hot water) heating system using an outdoor boiler with wood as the fuel source. Some of these heaters are now EPA approved related to emissions. That approval implies fewer smoke nuisance problems as well as more efficient burning and less wood to cut. We are exploring wood furnace heat to supplement our propane heater. Our woodlot produces more than enough fuel and it might be cheaper depending on how efficient I am with a chain saw. Wood chips are also fairly affordable and their price is more stable than propane or oil. I have not decided for sure on a wood furnace yet but one vendor with several models to choose from is Northern Tool. I welcome leads on other furnace dealers in WNC. My rationale on considering wood furnaces is that they are somewhat less expensive than wood boilers, tend to have fewer emissions because they burn hotter. Since we want hot air eventually it may save heat transfer losses buy avoiding going from hot air to hot water and back to hot air again. I am still working on this concept so comments are welcome. I recently heard about an innovative design that at least one local grower intends to use to heat a greenhouse called a rocket mass heater. It uses the mass storage methods also used in Russian or Finish masonry stoves. 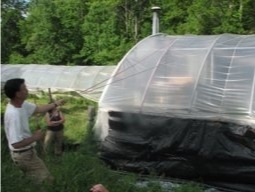 With mass heat storage devices such as water barrels, rocks or cob in this case, be aware that in critical situations (single digits outside and tomatoes that want 55 degrees inside) you man need a supplemental heater to move heat into the greenhouse air more quickly than is possible with convection from warm surfaces. Thermal mass may be able to reduce the load on your heating system over long run and save on propane. Many of these structures are operating in China and at least one in Manitoba. If oil availability is likely to decline in the future the more complicated design of these passive solar stuctures is likely to make more and more sense.